Loved every bit of this, even when I was horribly stuck! If I could figure out how to give this game stars on itch, it would get 5. 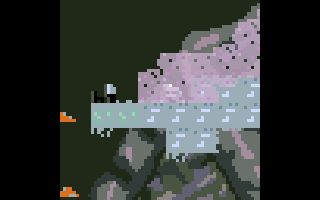 I think I'm stuck in a ditch in the lower left tooth part of the skull room though. There's no birds to burn and I can't seem to jump high enough to get out. I've been searching to see if there are any hidden secrets. I found what I hoped would be a shortcut, falling off the level on the first bone then landing on the birds on the way back to get here early. The blocks weren't solid and I couldn't use the cpu which made me think it was unintentional. I then used the birds to climb all the way to the top right roof of the cross bones but there was still nothing. It was still really fun to look around. I had a creature fall off the stage with me and then used it as an island on the way down too which was also pretty satisfying. Here's a shot I took from that. Anyways yeah this game is quite a masterpiece! Oh my! I did not expect you to get there! You totally broke it haha! I did anticipate people doing stuff like that but in the later rooms when you have the whip functionality. And I have a spot or two where I think it would be cool to add a secret thing (but nothing yet!) I have no clue how that beast got down there! You may be conscripted as my new playtester! Thanks for the "masterpiece" comment, super humbling. The game that inspired the glitchy "am I really supposed to get there?" 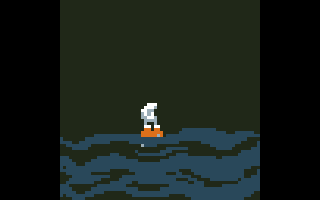 style of exploration is a game called Fjords by Kyle Reimergartin. I recommend you check it out if you haven't already! Watched some gameplay of fjords and it looks super cool! I think I've heard of the game but never actually seen it until now. Yeah I got up to the non functional cpu without the whip at first, but then to get further up I went and got the whip then just went back through the cpu to the previous room. And the beast wasn't down there at first, I guided it from the sideways skull room I think? It's up on some blocks or something and if you fall around that area into a gap there's a small hole that leads out into the abyss. so I just let the beast fall through it, followed it down and froze it at the last second. If/when you update it I'd definitely be happy to test things further, you can contact me if you like, I'll probably still go back at some point to try a few other things out with the whip in the meantime!